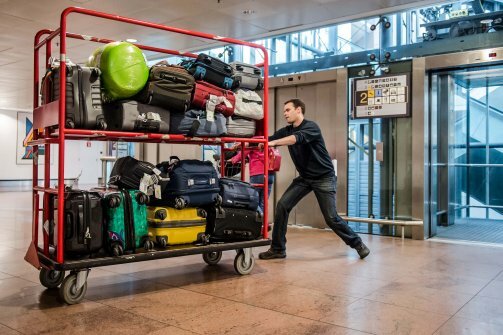 A Brazilian group’s plan to treat suitcases like air-hockey pucks beat out 617 other proposals to win Airbus’s student contest to promote more efficient air travel. One of the world’s largest aircraft manufacturers thinks the key to the best flying experience might come from green technology and is hoping that the next generation of scientists will discover it. On Friday Airbus announced the winner of its biennial Fly Your Ideas challenge, a competition that encouraged college students to brainstorm and sell their ideas on innovative and green improvements to the airplane industry. A total of 618 teams from around the world submitted ideas for the competition, and after three rounds, including a presentation and video creation phase, Team Levar from the University of São Paulo in Brazil was chosen as the victor. Team Levar championed the idea of a smoother way of transferring luggage from an airport truck to the cargo compartment of a plane. In fact, the transition idea could be considered a breeze, because they suggested that the luggage be transferred via air. Think of how a puck moves on an air-hockey table. The group of five students presented an idea that would cut down on friction, and thus time, allowing airplanes to ultimately run on better schedules. They won a cash prize of €30,000. The ideas of the four other teams who made it to the final round, hailing from Australia, India, Malaysia, and Italy, were equally as innovative. One team proposed harnessing the body heat lost from passengers sitting in their seats to power the overhead lighting. The second price, worth €15,000, went to a team from the Royal Melbourne Institute of Technology in Australia, who proposed a method of powering airplanes purely off methane gas—a mixture of biomethane and liquefied natural gas than some scientists consider safer for the environment.